Families affected by Alzheimer’s disease or other dementias witness heartbreaking changes in their loved ones. Different approaches can help free hearts and minds to open up and be present with the person inside the illness. Long-term relationships between each family member and a person with Alzheimer’s disease (AD) have a rich depth and dimension that cannot be matched by social work professionals just beginning to enter their lives. But within this richness, there is a particularly challenging journey for family members finding ways to reach into the world of a loved one with AD or other dementias. The disease alters what family members have come to know and love (or not) about the person over the years: those predictable behaviors and ways of interacting. What are family members supposed to do and say when their mother comes to a party wearing a slip over her dress or when she insists she is still raising young children who need to be picked up from school? How are family members supposed to react when a loved one they have known their whole lives does not respond as he or she did before or doesn’t even know them anymore? The disease takes away pieces of a loved one, sneaking up little by little until one day, family members cannot recognize the person any more. 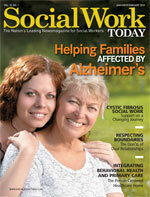 Social work professionals are blessed to have extraordinary resources at their fingertips that can be shared with families to provide countless suggestions, bullet lists of do’s and don’ts, descriptions of the disease’s impact, and avenues of approach to help broaden families’ understandings about their loved one who has AD or another dementing illness. Yet if we stay only on that level of left-brain informational exchange, we are missing core opportunities to help families see beyond how the disease manifests and to promote their ability to heal by connecting with the person inside dementia. These opportunities can be discovered when we pay close attention to our most valuable resource: family members and the individuals with dementia. I vividly remember a talk with Frieda, a daughter of a resident at a skilled care facility. She was frustrated because she did not know what her mother was saying, how to spend time with her, or how to respond. She desperately wanted to connect with her mother and expressed deep sadness and pain with the disconnection. I listened, allowing her to vent her feelings and concerns. When she finally asked me how she could reach her mother, I moved into teaching mode to provide her with concrete tools for relating with her confused mother, fully armed with corresponding handouts and resource information. Frieda was attentive as she listened to me, nodding her head at all the appropriate moments. It felt good to help her. At that moment, we both realized that Frieda was distancing herself from “this” mother with hopes of avoiding the painful feelings of loss. To be fully open to connecting with her mother in the present, Frieda had to deal with the reality that the mother who raised and nurtured her, gave her strength, and always knew the right thing to do to put Frieda back on top of the world was no longer available in the same ways. We created opportunities to sit together, and Frieda began the process of acknowledging and working through her grief. There is no norm for mourning, no predictable pattern, and no time frame for adapting to the countless changes and losses families experience during their loved one’s often ambiguous and slowly progressing disease. Each family member’s relationship with the same person with dementia is unique. One adult child may need to grieve the loss of an exceptionally tender and loving parent while a sibling may need to grieve the loss of the hope of ever experiencing an authentic connection. Families that can remain open to sharing their stories with a trained social worker have a distinct advantage. Our training beautifully prepares us not only to be therapeutically available throughout the grieving process but also to bring our attention toward finding the strengths within the rich stories of family history—strengths that can be clues to how families can reach into the world of the person with dementia and have authentic connections in each moment. Daniel was a devoted son who had a difficult time with his mother’s decline. Suzanne, his mother, was nearing the end of an 11-year journey with AD. Daniel and his wife had cared for Suzanne in their home for eight years and when they could no longer physically handle her care, they placed her in a skilled nursing facility. Daniel was actively involved with his mother’s care team and spent a lot of time educating himself about the disease and being by his mother’s side as her abilities to interact with the world changed. However, Daniel had a very hard time visiting his mother in her current debilitated. She was bedridden, her arms and legs were contracted, her sky-blue eyes never focused on him anymore. Each time he visited, he could see only the ravages of the disease and not his mother. Understanding how the disease process created the changes in his mother had helped him remain connected to her through 11 years. Now, however, he struggled to find what he could relate to with love. Daniel showed me how searching for the gifts received during a lifetime relationship can have a profound effect on families’ abilities to be fully open to making a connection with their loved one in each moment. When we allow families to introduce us to their loved one through their eyes, they will share thoughts, feelings, and memories (happy or not) about who this person with AD has been in this world. They explore the qualities that the person exhibited throughout life. They explain how their loved one encouraged them, either directly or indirectly—qualities for which the family member is appreciative or can relate to with love. For family members with a challenged relationship history, using the word love may be difficult and can certainly be substituted with the words respect, honor, appreciation, devotion, fondness, admiration, or positive regard. A major part of working with families grieving the loss of the loved one they once knew includes encouragement to explore a spiritual inventory of their relationship of having lived with this person (who now has dementia) throughout life. What has this relationship taught them about love, tenderness, vulnerability, suffering, intimacy, communion, courage, strength, survival, power, and faith? A very important part of the mourning process and adapting to the onslaught of losses is to internalize aspects related to the person who is being mourned. What aspects of that person helped to create and enrich who that family member is today? Finding some common bond or some aspect about who the family member is today and how he or she was positively influenced by the person with dementia can elicit warm feelings that place family members in an open, loving state as they experience initial moments with the person who has dementia. When their attention, intention, and focus are on loving or holding the person with dementia in tender and positive regard as they approach the next interaction, they will extend real warmth into meeting him or her. This warmth creates an open, spacious, and receptive environment for an authentic connection. Without the love, tenderness, or respect that the families bring to the moment, creating any kind of rapport with the loved one who has dementia is a long shot. As family members enter the moments in this open and positive state, the person with dementia sees and hears this in the family members’ body stances, voices, facial expressions, and words—possibly without family members even being aware of their physical and vocal qualities. Each family member becomes calm and as gently relaxed as a close friend because each holds in his or her heart the positive feelings associated with the person with dementia. All of these manifestations toward lovingness are known to be effective when interacting with persons who have dementia. And still, some families need to have more “hard evidence” before exploring further. Exciting research is being conducted at the Institute of HeartMath in Boulder Creek, CA, the results of which are published in The HeartMath Solution and Transforming Stress: The HeartMath Solution for Relieving Worry, Fatigue, and Tension. This research shows that positive emotions such as compassion, caring, love, and joy produce smooth or more ordered heart rhythm patterns. These smooth rhythms correlate to lowering blood pressure, releasing stress-reducing hormones, and increasing immune responses and brain function that support clear and efficient thinking. We just feel better physically, mentally, and emotionally. More jagged or disordered heart rhythm patterns result from stressful emotions and tend to correlate to the opposite of all the good things produced by positive emotions. Even more pertinent, the research shows how heart rhythms, both smooth and irregular, produce electromagnetic signals that impact others. The heart’s electrical field has been measured to extend beyond the body up to 10 ft, which is only as far as equipment can measure at this time. Just as important, the electromagnetic signals emitted from an individual’s heart rhythms have also been measured in the brain waves of other people around that individual. This study indicates that we are literally making waves as we feel emotions, and those waves affect the heart rhythms and brain waves of the people around us. This energetic nonverbal communication via heart rhythms produces an immediate and deep understanding and connection between human beings. This information is both comforting and empowering for most families, leading to a more concrete understanding of how entering each moment with positive emotions and their associated smooth heart rhythms literally helps the person with dementia do the same. So there is no right thing to fix, do, or say as much as there is the need for families to focus on the importance of being with, or presence. Smooth heart rhythms give each person a greater potential for adapting to stressful events, improving overall health and well-being, and improving communications; the potential for connection is maximized. The connections may be very subtle and below our level of awareness, but they are real. Each person feels the benefits. Being on the same positive wave, then, is a potent win-win situation. As social workers, we have extraordinary opportunities to walk with families through their grieving and simultaneously help them discover and acknowledge the gifts received throughout a lifetime of interactions. We can encourage them toward a new way of entering each moment with their loved one with dementia: to take a break—just for the moments they are about to enter with their loved one—from making sense of anything, from negative reactions or difficult emotions, from fixing or doing anything, and enter those next moments with an open, respectful, nonjudgmental positive regard. When families let go of whatever gets in the way and fully open themselves with compassion in those moments with their loved one, they become more receptive to allowing the unfolding of the moments that follow and entering the loved one’s reality and truth without judgment. We can encourage families to allow time for the person with AD or other dementia to take the lead and introduce them to his or her world in those moments. “The Dance” exercise (see below) is an excellent one for families to practice following someone else’s lead. As they practice and begin to truly pay attention, they will notice how the person with dementia responds and will see evidence of what is and what is not effective. They will make adjustments to better meet the person where he or she is in each moment. At times, families may feel as though they are in a foreign country. This is actually not a bad correlation. Persons with dementia often speak in what sounds like a foreign tongue; they are frequently in a different time zone and dimension, operating from unfamiliar points of reference. As is true when we travel, when we take time to acclimate to the environment and negotiate the new territory, we begin to understand how to communicate with others. In letting go all that gets in the way just during those moments of interaction with the person with dementia, family members may experience moments of feeling lost, but they also create new open space that allows the entry into and evolution of moments so much more precious than they could have imagined. By letting their loved ones guide them into their world, families will stretch beyond their limitations into more freely expressing their own playfulness and joy. When dancing in their loved one’s world, families can begin to see the many ways they continue to express their wisdom and enjoy moments of mutual spontaneous emotion. When such experiences are shared, each person moves out of isolation and hopelessness. — Nancy Pearce, MS, MSW, is a licensed geriatric social worker with more than 20 years of experience working in long-term healthcare and hospice settings. She specializes in dementia care and is the author of Inside Alzheimer’s: How to Hear and Honor Connections With a Person Who Has Dementia. Families have often reported the positive impact of this very simple exercise. It is not designed to literally be done with a person who has dementia but to help families experience a heart understanding about exploring the possibilities of connection when allowing the person with dementia to take the lead. Stand or sit in a comfortable position so you are directly facing the family member. Let the family member know that you will put yourself in the role of the person who has dementia and the family member is to simply be himself or herself. Put both of your hands up in front of you, flattened hands with fully extended fingers, palms facing the family member. Ask the family member to put both hands up to meet yours so your fingers and palms fully touch. With hands in position, ask the family member to push against your hands while you resist their push. Have the family member notice the resistance your hands are providing against the pushing. The harder the push, the stronger your natural response to push back. Next, ask the family member to focus on keeping both hands flattened and fully connected with yours wherever they move. Move your hands gently from side to side, up and down in a variety of predictable and unpredictable ways. Notice and reinforce the family member’s ability to follow the movements of your hands to stay connected. You will undoubtedly each discover some playfulness as you keep moving your hands about—perhaps beginning to laugh, singing a song that comes to mind, or swaying your bodies with the movements. Get into it! Enjoy! At some point, you may find yourselves blurring the boundaries of who is leading, interchanging the roles. That’s a good thing; you are now doing the dance.